Samajwadi Party (SP) national vice-president Kiranmoy Nanda on Sunday said his party, together with the BSP, is strong enough to defeat the BJP in Uttar Pradesh in the upcoming general election and there is no need of an "insignificant" force like the Congress to make it happen. He, however, hinted that the SP-BSP alliance might just leave aside the Rae Bareli and Amethi constituencies, represented in the Lok Sabha by UPA chairperson Sonia Gandhi and Congress president Rahul Gandhi respectively. "In Uttar Pradesh, the Congress is an insignificant force, so we are not even thinking of including or excluding it. "The SP-BSP alliance is the main force which will take on the BJP. The Congress might be there in one or two seats, it is for the Congress to decide what position it wishes to see itself in," Nanda told PTI in an interview. His comments came two days after Bahujan Samaj Party (BSP) supremo Mayawati and SP leader Akhilesh Yadav moved closer to finalise a seat-sharing formula, ahead of the Lok Sabha polls. Both the leaders held a meeting in New Delhi on Friday. Nanda felt the Congress was yet to adjust to the mantra of "alliance politics" as it was unwilling to "leave even an inch to its allies in states where it is strong, but expects others to share their pound of flesh with it in states where it is a weak force". Asked whether keeping the Congress out of the alliance in Uttar Pradesh would be an advantage for the ruling Bharatiya Janata Party (BJP), he said, "From our past experiences, we can say, in cases where the Congress had fielded candidates against the SP-BSP alliance, we did not face any problem in defeating the BJP. The Congress's vote share is completely insignificant. "Rather there have been instances where the Congress had not put up its candidate in a seat and the BJP got its vote share." Nanda cited the examples of the Phulpur and Gorakhpur Lok Sabha bypolls, where the Congress had fielded candidates against the SP-BSP nominees, but that did not deter the alliance from defeating the BJP. Referring to the recently-held Assembly polls in five states, he said had the Congress worked out an alliance in Rajasthan and Madhya Pradesh, the BJP would have faced a complete ouster in the two states. "Did the Congress go for a pre-poll alliance with the SP-BSP in Madhya Pradesh and Rajasthan? The answer is no. The Congress's policy is it will take benefits from everybody, but when it gets an opportunity, it does not want to share it with others," Nanda said. 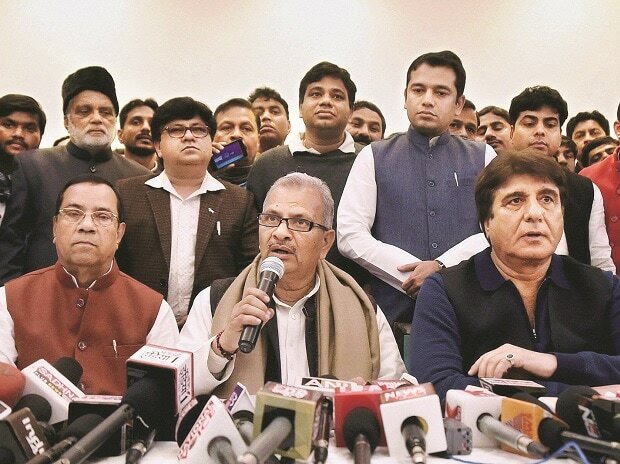 The former fisheries minister of West Bengal during the Left Front regime asserted that the SP-BSP alliance would be a "gamechanger" in the general election in Uttar Pradesh, which has 80 Lok Sabha seats. "Going by the current situation, it is clear that the SP-BSP alliance will sweep Lok Sabha polls in Uttar Pradesh. The BJP will be ousted. The SP will play a vital role in the next government formation at the Centre, but we are not in the prime ministerial race," he maintained. Nanda also refuted the claims that Shivpal Singh Yadav's Pragatisheel Samajwadi Party (Lohia) might play a spoilsport for the SP-BSP alliance in the Hindi heartland state. "New parties crop up prior to the Lok Sabha polls in politically sensitive Uttar Pradesh, but they fail to create any impact," he asserted. Talking about the choice of prime ministerial candidate of the opposition alliance, Nanda said the matter would be decided on the basis of consensus after the polls. "We are not averse to anyone for the prime minister's post but that issue will be decided after the polls, following a discussion with all the parties," he added.